There are Chinese restaurants in almost every corner of Barcelona, but there is none as special and spectacular as Indochine. This restaurant, designed by Cambodian Chef Ly Leap, not only offers Chinese cuisine, but is based on Asian cuisine in general to create their dishes. Located on Muntaner Street, on Eixample Esquerre, it is one of the essential restaurants in Barcelona. Entering Indochine is like entering a Cambodian town in the middle of the jungle. The decoration is cared for in an exquisite way, and only for that reason it is worth the visit. This Chinese food restaurant has an area of one thousand square meters decorated with lush vegetation, orchids, rocks and sculptures and reliefs of the Buddha and other Hinduist images. But the most impressing thing about Indochnie is the layout of the tables. The whole restaurant is full of water channels and wooden walkways, and inside the canals there are tables placed as if they were islands above the water. The feeling of sitting in these tables is like being immersed in rainforest, surrounded by vegetation and fish (yes!, in the water of the channels there are real fish!). On the other hand, the kitchen of the Indochine is totally open, that is, it is surrounded by glass that allows you to see at all times how chefs work. It is an added value because they show that they do not hide anything and it is always interesting to see how they prepare the dishes you should eat with traditional utensils such as wok or mortars. Finally, an element that draws the attention of the restaurant is the floating hut from the Mekong River. This hut just rounds up a decoration designed for detail so that eating in Indochine is not just a gastronomic experience, but it is a total experience. In this Chinese restaurant of Barcelona you will not only find Chinese food, but the menu is inspired by a wide range of Southeast Asian cuisine that combines intense and deep flavors. Spices, aromatic herbs and citrus fruits are the main characters of Indochine cuisine, and they are transported to Asia's most exotic. The tasting menu is the best way to discover everything chef Ly Leap offers us. Thus, you will taste all kinds of spicy, bittersweet tastes, the aromatic nuances of coconut, turmeric, ginger, mint... A tour of Asian cuisine with a modern touch that will not leave you indifferent. By using traditional techniques combined with the cuisine from here, it has resulted in a fusion cuisine for demanding palates. In the Indochine menu you will find fish, such as king prawns, macerated with green and citrus mangoes, meat with aromatized raisins, chicken with ginger or veal with citrus, as well as rice and pasta that can not be missed in Asian cuisine. Glue in the Indochine's rainforest and let yourself be captivated by the exotic flavors of Asian cuisine! Unforgettable place to eat, will you miss it? If there is a pastry shop in Barcelona for a must, this is the Escribà pastry shop. Located on la Rambla of the city between the Liceu and the Boqueria market, Escribà pastry shop is a small and cozy place that is always crowded. The building draws the attention of everyone who is passing by. It is an old pasta factory, the former Casa Figueras, decorated in 1902 by the painter and the designer Antoni Ros i Güell. The corner that occupies the house is decorated with a great sculptural relief that represents a woman who mowing, a tribute to the work that was done before at the factory. The façade of this pastry shop in Barcelona is modernist, with the centerpiece arches and the windows full of polychrome mosaics, stained glass and wrought iron. The Escribà pastry shop, as well as being one of the best places to eat in Barcelona, is also a tourist attraction to contemplate it from the outside. In 1906 the building became a pastry shop when Mateu Serra i Capell opened the Forn Serra, beginning with the tradition of this pastry shop in Barcelona. At that time, he contracted a pastry chef, Antoni Escribà Cases, and with him began the generation of Escribà pastry chefs, which has come to this day with internationally renowned chef Christian Escribà at the head of the fourth generation of the family. The slogan of the Escribà pastry shop is "to excite, to surprise and to create unique moments" and they obtain it with unique and original creations devised by a team of pastry chefs of first level. If you are looking for places to eat in Barcelona, this pastry shop is essential. Now that the Christmas days approach, you can find wafers and nougats, and if you are in Barcelona for Easter, you can taste the traditional “mona de Pasqua”, a typical Catalan cake for that days. One of the main characteristics of this pastry shop is the innovation and the originality of its products, which makes them stand out among the rest of pastries in Barcelona. They are specialists in creating all kinds of shapes and figures with fondant and also with chocolate, and in that sense their red lip chocolates are famous, or their personalized pastries for special occasions. This pastry shop is so well known in Catalonia that even a reallity show was made in the Catalan television. 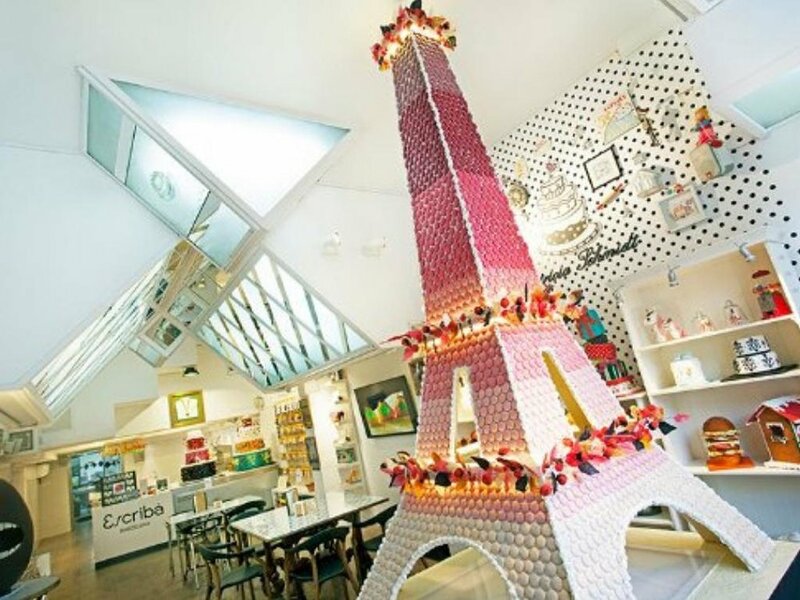 If you are visiting Barcelona, do not miss the Escribà pastry shop, the best pastry shop in the city. You can make a coffee or a tea by tasting the most delicious cakes. You can take advantage of our VIP tour to mark this pastry shop as a place to visit! 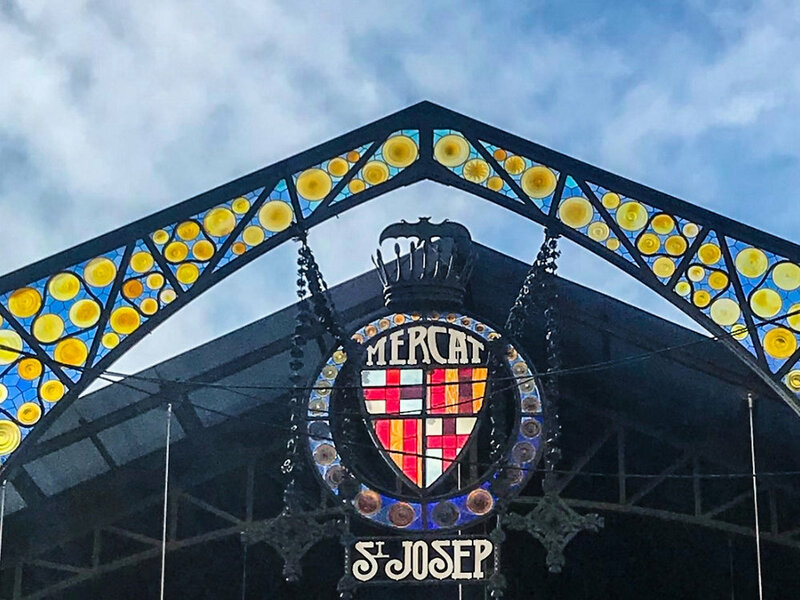 On the Rambla of Barcelona, close to the Liceu, we find the Sant Josep market, popularly known as La Boqueria market. The name of Sant Josep comes from the old convent that founded the order of the Carmelites barefoot in 1586. As the Rambla became important as a walk through the 18th century, the slaughterhouses were taken out which was on his way and they were located in the orchard of the convent. But on July 25, 1835, the convent of Sant Josep and others in the area were assaulted and set on fire during an anticlerical riot instigated by liberal politicians of Barcelona, and after this fire the convent was overthrown. In its place, a square with large columns surrounded by arcades was built that became the largest in Barcelona. La Boqueria market, as we know it today, was inaugurated in 1840, when finally, the stands that street vendors and farmers from nearby farmhouses were outside the walls to save taxes were absorbed by the growth of the city. That same year the works on the roof began, just on Saint Joseph's day. La Boqueria market has an area of 2583m2 and has more than 300 stands. The metallic roof, which was so characteristic of the building, was opened in 1914, and the last architectural modification of the market took place in 2000. The modernist arch that attracts the views of locals and tourists was restored in 2012, almost 100 years after its construction. Architect A. Falguera designed an arc decorated with blue, yellow and brown geometric stained glass windows supported by two columns decorated with ceramics, and is now again seen as the first day. In La Boqueria food market more than 300 market stands offer a wide variety of local and exotic products, and are sold to both private buyers and restaurateurs in Barcelona. There are more and more stops run by sellers from Japan, Italy, Greece or the Arab countries, which offers a great cultural diversity in La Boqueria market and makes it an indispensable place for tourists. It is the largest market in Catalonia, and its architecture, its location and its diversity make it a must. You can visit it by bike with our tours. The church of Santa Maria del Mar is located in the Ribera district of Barcelona, near the port, and was built in the 16th century, between 1,329 and 1,383. The neighborhood was the nerve center of merchants and unions, and it has always been considered that this church must belong to the people of the neighborhood because it was they who, either at work or with money, made it possible to build the temple. The first stone of Santa Maria del Mar was put on March 25, 1,329, and the last keystone on November 8, 1338. The great heroes of this church were the “bastaixos” (or porters), workers who carried enormous stones for the construction of the temple one by one. They were taken down from the royal quarry in Montjuïc, or they were also transported from the beach, where boats with large rocks landed. 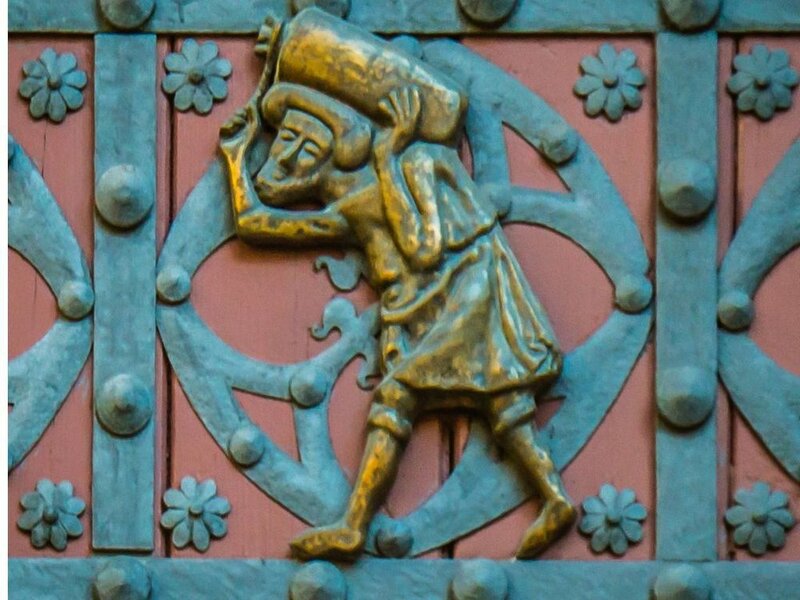 At the front door of the church you can see an image that pays homage to “bastaixos”. Santa Maria del Mar is the most emblematic example of the 14th century Catalan Gothic style. It is characteristic of this architectural style the horizontality of the buildings, and this church is a good example with the 16 octagonal columns that one can see just entering the temple. The church, however, has been the victim of heavy ravages throughout its history. In the year 1,428 an earthquake that affected Catalonia made the rosette fall, and the collapse caused some deaths. 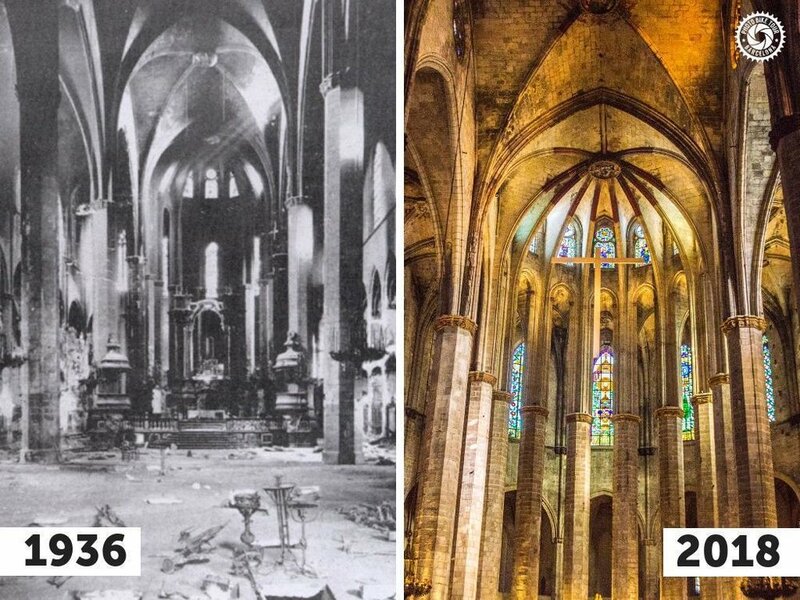 Later, in the 20th century, Santa Maria del Mar suffered a devastating attack in 1,936. On July 19 of that year the church was burned down and burned for eleven days in a row, causing the destruction of the baroque altar and all the images and archives that were in the temple. The subsequent reconstruction emphasized the gothic architecture with a sober and elegant style. The church of Santa Maria del Mar has transcended the earthly plan to inspire the creativity of the artists. Thus, the writer Ildefonso Falcones wrote the novel La Catedral del Mar (2006), which was later adapted to television fiction with a series of homonymous title. Find out how to discover Santa Maria del Mar and more other emblematic places of Barcelona with our e-bike tours.